England have a future star in Harry Maguire, and benefitted from a Jordan Pickford masterclass, but it is too early for the “Football’s coming home!” chants, warns RT’s Peter Schmeichel. 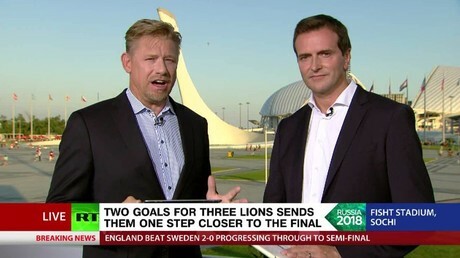 But Schmeichel was surprised at the lack of resistance offered by the normally stout Swedes, who had managed to neutralize a string of powerhouse teams, including France, the Netherlands and Italy on their way to the tournament with their rigid defensive tactics, and similarly put away Mexico and Switzerland once here. “Sweden looked like a team that had enough of the World Cup. They looked tired, like they were happy with the quarter-finals and wanted to go home. England looked like the team that really wanted to get to the semi-final,” said the RT expert. Schmeichel praised the sheer variety of England set piece play, which has turned into a “serious weapon” for them at Russia 2018 – three-fourths of their goals have come from the dead ball – and reserved special praise for the scorer of the opener in Samara. “Harry Maguire is one of the players with the biggest potential at this World Cup,” said Schmeichel, noting that he had watched him play alongside his son Kasper at Leicester over the past season, but that he had elevated his play. But the man of the match for Schmeichel was fellow keeper Jordan Pickford, whose “outstanding” saves allowed England to play with composure afforded by a two-goal cushion as they sailed into the semi-finals against Russia or Croatia.